Gifts to employees or customers are a traditional way to spread cheer and thanks to people important to your business during the holiday season. But the IRS says certain types of gifts are taxable and making sure you follow the rules can avoid a Grinch-like spoiler later. 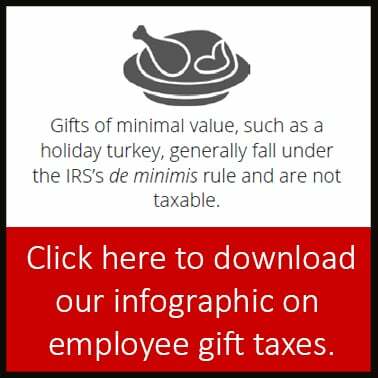 Some gifts, however, are treated as taxable income to the employee. For example, all cash or gift cards redeemable for cash are taxable to the employee, even when given as a holiday gift. Likewise, monetary prizes, including achievement awards, as well as non-monetary bonuses like vacation trips awarded for meeting sales goals, are taxable compensation – not just for income taxes, but also for FICA. Withholding applies. Many companies also give gifts to highly valued customers during this time of year. The IRS is less generous about giving companies a break on these gifts and limits how much a business can deduct to $25 in gifts per person per year. This $25 limit applies whether the gift is given directly to an individual customer or indirectly to the company, but intended for individuals. Giving a gift to a customer’s family does not get around the limit. Those gifts are treated as though they were given to the customer and are subject to the total limit for the customer. Similarly, gifts from different members of a partnership with one person are treated as though they all are coming from one source and the total deduction is limited to $25. A bit of good news: Incidental costs, such as engraving, packaging, insurance, and mailing generally do not count against the $25 limit.